You will have heard in this election that there’s nothing the city council can do on growth; it’s the province forcing us to grow. Here are the facts. The province sets growth forecasts that are divided up by Halton Region to the four municipalities: Burlington, Oakville, Milton and Halton Hills. Burlington’s share of growth is 185,000 by 2031. As of the 2016 Census, we were at 183,000. So we have met (and likely exceeded) our growth forecasts already – 13 years early. And yet, the current mayor and council recently approved an 18 storey building in an area downtown that is 4-8 storeys in our current Official Plan. That is 2 to 4 times what’s required. And that’s just one project. Approvals beyond the Official Plan have occurred in neighbourhoods across Burlington, including in Aldershot (Ward 1), Alton (Ward 6), and on Dynes Road (Ward 4) and Georgina Court (Ward 5), where residents are appealing these two decisions on their own dime. 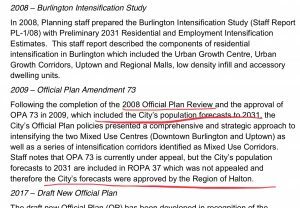 ur Current Official plan was updated in 2008-9 to include our growth forecasts. 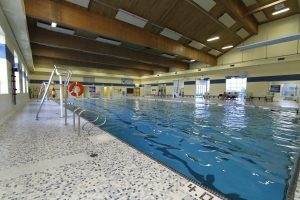 Our plan was approved by the province when approved by the Region (Halton Region is tasked with implementing provincial policy; regional approval is essentially provincial approval). If we follow our own approved plan we will satisfy provincial population growth. (See analysis done in staff report PB-62-17 for the 23 storey building at Brant and James, approved by council in November, which I didn’t support. It shows we’re on track to meet or exceed our growth forecasts downtown). There’s no need to go up to four times more than the Plan. Though the growth forecasts are minimums, prudent planning requires that we stick as closely as possible to the Plan. The risk of going well beyond the Plan is that our infrastructure is tied to our Official Plan; go past the Plan the infrastructure won’t be in place. Our development charges are also tied to our Official Plan and growth forecasts. If we go past the plan we are under charging for development charges, and ultimately tax payers will pick up the difference. So, we don’t have to vote for overdevelopment beyond the Official Plan and it’s not a good idea to do so. And no one can blame the province for their own votes to overdevelop. 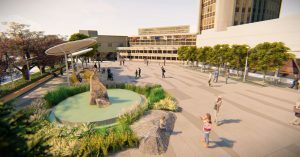 I’m the only council member who has consistently supported projects closely tied to the Official Plan – and consistently voted against projects in any neighbourhood that are well beyond the Official Plan. Voting track record means more than promises made in an election. We’ll get new growth forecasts from Halton Region to 2041 in the next term of council. You want a mayor and council who will advocate to take only what growth our infrastructure can handle – and our citizens support. That’s my commitment – and my track record. I agree, but MMW is clearly not anti-development! I believe what you have stated is true. No one seems to be challenging you on your facts. 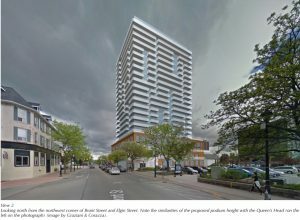 The question that haunts me is why; why did the Planning Department propose & Council approve the 23-storey monstrosity at Brant & James, and the new Official Plan (just as control has been grasped from the pro-developer OMB)? We are left with only a few choices: ignorance, ambition, complacency, weak/ lazy, complicit ( the latter of which can be resolved by a forensic audit). Hopefully, we will be able to move on with a broad change mandate, a new council and you as our Mayor, this Monday.